I’ll take a “double grande” Starbucks passion tea lemonade. 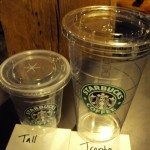 So who here wants to see the Trenta size come to a Starbucks near you? In all honesty, I think it is terrible for the brand image because it associates Starbucks too closely to the idea of “Super Size Me” or “Super Big Gulp”. In fact, I’m sure on a hot summer day, I could really drink 31 ounces of a Tea Lemonade, but the idea of a 32 ounce Frappuccino makes my skin crawl. As it stands right now, I never order a size larger than a tall for a Frappuccino because that is all I can drink. Nor can I imagine what the price point is for this beverage. Exactly how much does a Trenta Passion Tea Lemonade cost? That’s a lot of beverage. Welle (pronounced Vella – It’s the German word for “wave”. Doesn’t really fit with the Italian themed sizing but sounds intriguing). Wave (well, one can kind of drown in that big of a drink). Those are all the ideas I can come up with! Maybe trendy Trenta isn’t so bad after all. Go go goodness! The big Starbucks lunch & bistro boxes food test. Cuppings are totally different. Cuppings are the method that are primarily used at roasting plants and by coffee buyers for quality control before they purchase it and also to ensure that the specific shipment of beans has gotten the correct amount and type of roast. If YOU were a coffee master then you should know this. Dont be so quick to blast Sage. Hey, it’s all cool. Minor synapse lapse on CAbarista’s part, is all. After rummaging through her purse for 5 minutes to dig out her Starbucks card, she then heads over to the condiment bar and pours the entire half-and-half carafe into the cup, along with a bunch of Splenda (leaving the empty packets all over the counter rather than tossing them in the hole that’s right there, of course). She then comes over and demands some whipped cream on top of the drink. How violent and gruesome of a death can you get away with inflicting upon her before the jury decides that your actions were unjustified? Just get two drinks. Trenta seems a bad idea to me. venti is plenty large enough. I’m still mourning the demise of the ‘short’ cup. (Reply to Melody) I agree, that might be a mouthful of syllables for some people. The G in “triginta” is a hard G.
to reiterate-I do know what a cupping is darth…thanks. Sage-thanks, and again, so sorry. @Enlightened Coffee Sage ugh…with all that half and half, whipped cream and bad attitude to boot, she has that all wrapped up herself! So I actually did a coffee cupping today. Used instructions from coffee geek. Few notes, Starbucks really doesnt have a good set up for this. From what I understand there is a specific type of spoon needed for a good cupping. I kept getting grounds in my slurp, but this could be because I was not very experienced in what I was doing. However some good ideas for it. One is that it is done with multiple people taking notes over time. There is no communication until the very end so that people arent influencing others. I love this idea. Also the tasting is sometimes done blind. For example I actually had a fellow Barista pick out a random coffee and put it in an unmarked bag. Most of my notes were actually correct. The coffee was Yukon. The taste was fairly similar to a coffee press. Most of the difference is in the Aroma. This is something that is never done in the midwest. Ever. Infact for a very long time I was the only non-SM coffee master in my large district because the program is non accessable to many baristas. I managed to do mine off the clock during lunches using mostly research on the portal as a guide and plenty of Coffee and Tea Resource Manual reading. Hi Darth! Very cool that you did a cupping. There is one downtown Seattle store that has done a cupping or two with some very coffee enthusiastic baristas (7th & Pike). If you go back and look at the entry “Arabian Mocha Sanani: Your introduction to a cupping” (Dig through archive, or heck, use google with Starbucks Melody cupping sanani) you’ll see some bare bones instructions and even a couple of nice photos of the official Starbucks cupping spoons! First thought, great article. I cant believe I missed that one. Second I need to bug my SM or order that spoon. I think he will because the one thing I do think he does well is ordering good equipment and things that the Baristas need. Ive had a mop bucket with two legs before (on opposite sides) and a store manager thats refused to replace it until it violated Ecosure. Great instructions. I need to try grinding finer next time. That may be why I had so much floating on top is that the grounds were more likely to float having a great mass and being more buoyant. And last I am jealous that you have Clover stores so near. There are tons of coffees and being so far away from a Clover market that I doubt I will ever be able to taste them. Here is funny. well, ironic, anyway. I go into my regular Sbux yesterday and the manager and another barista say to me: ‘Denise! 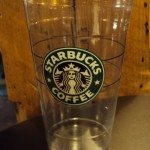 we were waiting to see you so we could ask you; what’s all this about a new sz Sbux cup?’ (someone had come in and asked for this ‘trenta’ sz, apparently) So, of course, I know all about it FROM MELODY’S BLOG!!!!!! which I tell them and hand out 2 more cards (Melody’s). too funny. they actually were waiting to ask me because apparently 🙂 I know alot of Sbux stuff. So, Starbucks store 2470 in Mt Prospect, IL thanx you Melody….for keeping them enlightened! Love it, not sure I can drink that much of anything in one try but holy cow, props the the caffine addict that can LOL. Thanks for sharing the pictures! (Reply to Kristen) – That’s an interesting observation. 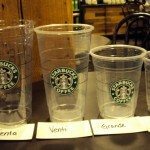 As I was taking the photos I noticed that the test Trenta cup is produced with #1 plastic, but the other iced cups are #5 plastic. The #1 plastic is truly much thicker and heavier, and even looking at those pics I can see the substantial difference. I am assuming that you’re noticing some of that too. Yes, Kristin is very much right. 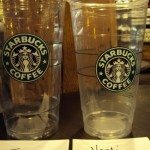 In fact, if you take a Venti, and put it inside the Trenta, it looks, and acts just like the Iced Venti plastic tumblers. While not as pretty, or durable, it is much less expensive. 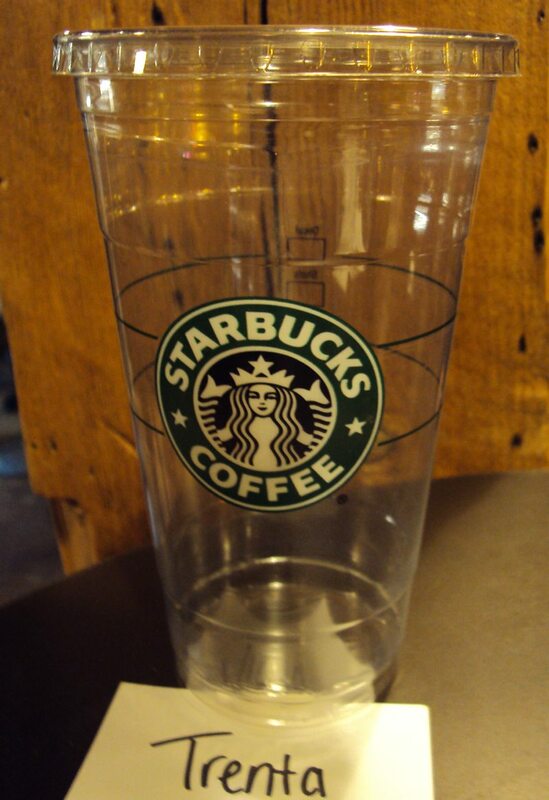 And if you use the Trenta lid, it doesn’t leak either. I actually hope it stays around, but who knows. To me, double grande would mean two shots of espresso. Looking at your pictures Melody the new Trenta does not look very much taller than the Venti. I agree with you and think, as you do, it is terrible for the brand image because it associates Starbucks too closely to the idea of “Super Size Me” or “Super Big Gulp”. 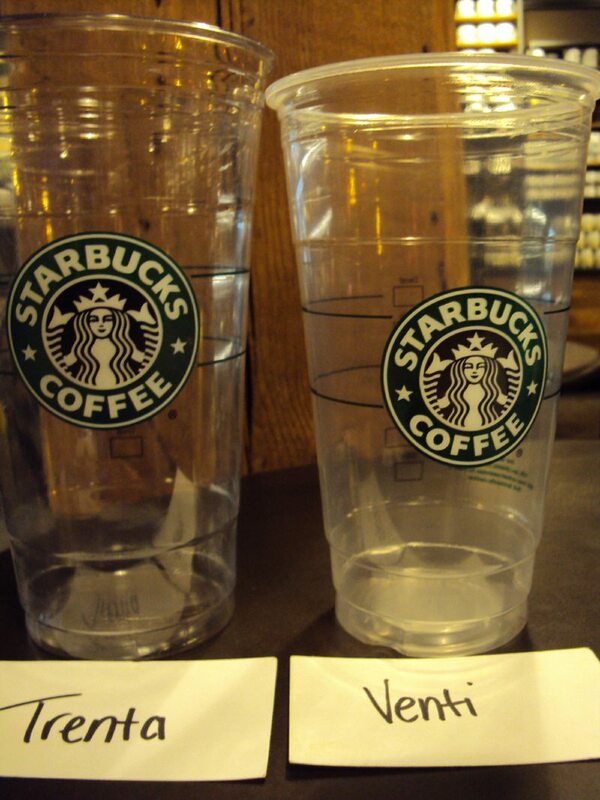 Those cups are amazing, but I don’t think we need a bigger size then a “Venti”. Also, I wonder how much they’re charging for these drinks of this size. nah, it may be that way if you are just a passing customer. It’s not just about a new size to me. It’s about what starbucks is and isn’t all about. I think they should call it “treinta y uno,” which is Spanish for “31” of course. Actually, I can think of how useful this size would be for iced tea on a long, hot car trip — like that last Starbucks stop at the top of the Grapevine before heading up the 5 through the Central Valley to San Francisco. Loved the idea of “Pequod,” too. If I drink too many Starbucks frozen coffee drinks, I will become a white whale.. . . . 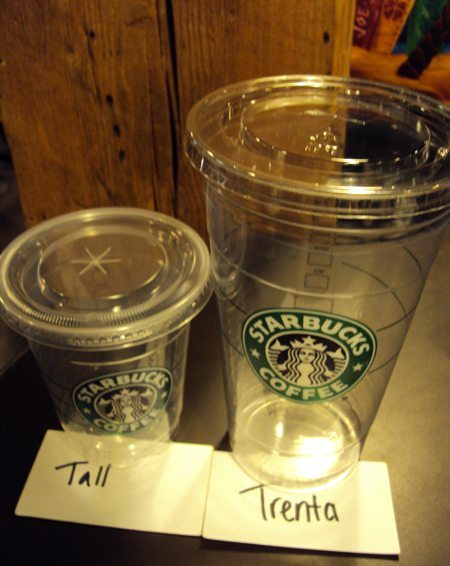 I prefer TRENTE because it sounds similar to VENTI. I believe people learn by sounds before they learn with words, so the sound of TRENTE sounds distinct enough to differ from a VENTI, but it sounds similar enough that people will remember it. Just a thought. French or not, unless people are willing to waste time doing research based on their difference of opinion (not agreeing with Starbucks keeping things consistent), I think the french name should be used! It just sounds better!! I’m with Mary but instead of TRENTE spell it TRENTI like VENTI. Ohter possible names, on a whimisical side, would be GLUTTON since you’d have to be one to order it, or HUMONGOUS. I love my trenta size. If it was available for frappuccino drinks, or something other than iced teas/coffees, I would agree with the “Glutton” name. I get a trenta iced tea almost every day. It actually lasts for a while, unlike the venti which I finish in a few minutes. Of course, it is HOT in Phoenix, with average daytime high of 105.3 degrees for June-August, the trenta was actually NEEDED. Trenta is Italian for 30. Size names at Starbucks are Italian due to the Italian heritage of the cafe’. 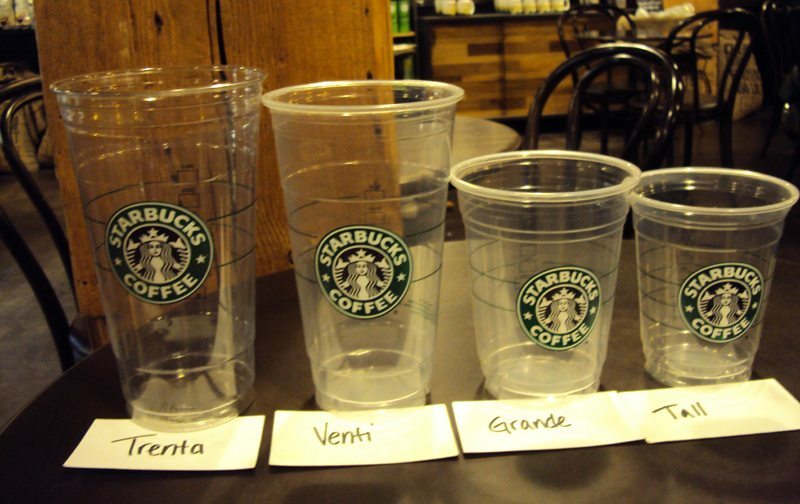 While the names grande, venti, & trenta are similar to French, and even Spanish, it is due to the Latin background of those 3 languages. I’m not sure if the Trenta test will expand beyond to 2 test markets (Phoenix & somewhere in Florida), but our test has lasted 3/4 year now, and it was only supposed to be 2 months. So, only time will tell. I hope it has grown. I need this size to stick around. In the “sunbelt” region, So Calif – Florida, it should be year round. Not sure about the cold areas though. I could understand “seasonal” sized, but that is really difficult in the stores. Have you check with @GAstarbucksgirl (twitter), I think she is in Georgia. I know that the test areas have not been “blankets”, but isolated districts. Not even all of Phoenix has them, and the original Florida test was even a small range of stores. I actually finally ordered my iced green tea in a trenta cup and in some ways enjoyed having it in this big cup because I was able to enjoy it for a much longer period of time. I would only order it in a trenta size at times when I wanted to have it for a longer time frame.